Louis Vuitton started with luxury luggages, Chanel designed handbags that freed up hands and Hermes became famous selling saddlerly. It was not until 1900 that the company started offering handbags, which were specially designed for riders to carry saddles. So every designer brand started differently, but each of them honors their history because it’s their iconic symbol, their identity. Identity is everything, if it’s gone, then everything-authentic about the company will disappear. That’s how Louis Vuitton came up with the Petite Malle Bag (inspired by the Classic Luggage), that’s how Chanel came with the Classic Flap Bag (inspired by the Reissue 2.55 Bag) and how Hermes came up with series of handbags inspired by Saddles like the Hermes Oxer Bag and this Hermes Harnais Bag. You see, it’s always a good thing to purchase a bag inspired by the house’s archives because you will be carrying a piece of its history. 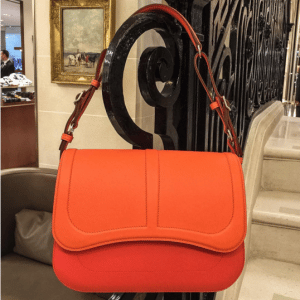 The Hermes Harnais Bag is first seen on the Fall Winter 2015 Collection, it comes with a shoulder strap and a large compartment in the interior with two flat pockets. There are many variations of colors available and normal leathers like Swift, Epsom or exotic like Alligator. Introducing the Hermes Harnais Bag. The Harnais Bag was first presented for the brand’s Fall/Winter 2015 Collection and makes a second return for the brand’s latest Fall/Winter 2016 Collection. The Harnaia is a flap bag with a shape of a saddle. The bag has an adjustable shoulder strap and comes with a lambskin interior and two flat pockets. It is available in a variety of Hermes leathers including: Swift, Epsom, Grizzly, Tadelakt and Alligator. The bag also comes in basic colors and different color combinations.